Yeah. It’s been a dog’s age. I know. I’m a bad blogger. 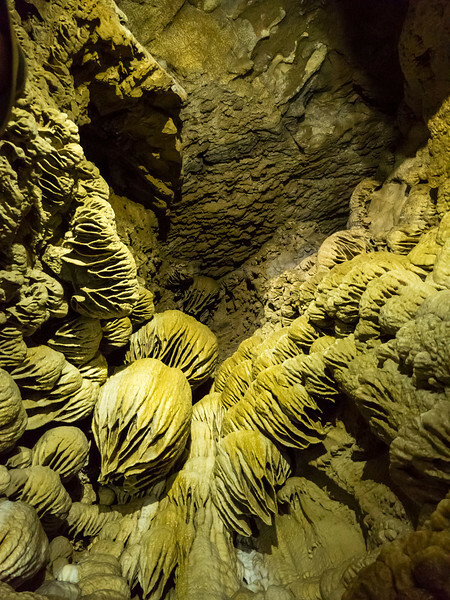 If you can guess the band that I snagged the post title from, you get…uh pictures of caves. Anyway, here’s more from the Oregon/California trip. After Crater Lake, we decided to head to Lava Beds National Monument. For some reason we had it in our heads that it would be a lot like Lassen, but we were in for a surprise. Lots and lots of caves. Very little supervision. 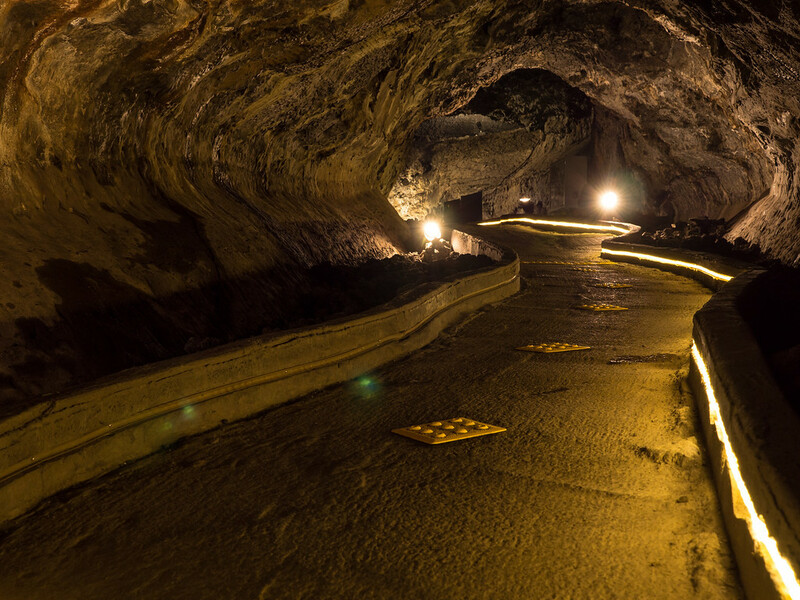 Only one cave in the whole gigantic park has lights in it. And unless you catch a tour with a guide and that person’s pet cave project, there are none. You are on your own. Awesome. We dig that and apart from the tour we went on, we only saw people one time when exploring the caves. It was so amazing. The intense darkness and silence were something I would love to experience again. A lot of people said they were afraid in the caves, but I never once felt anything like that. Just awe and humility. 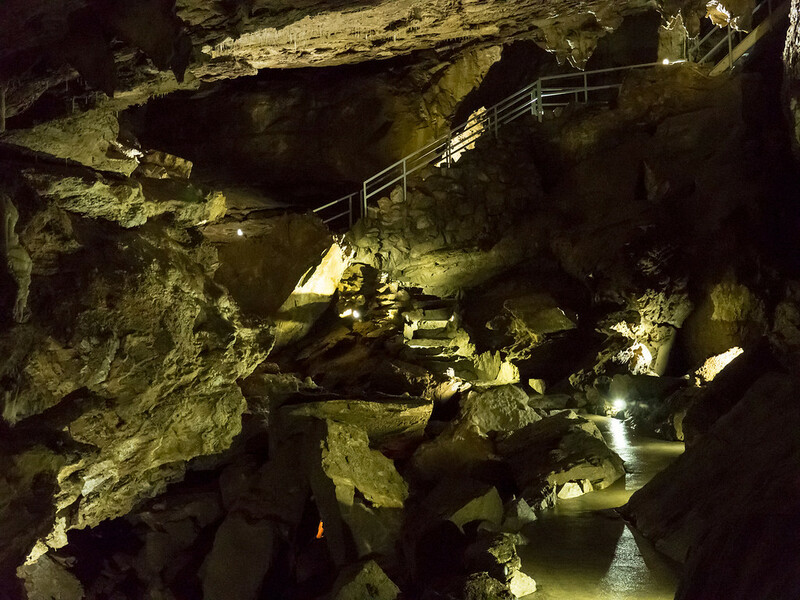 Anyway…here’s Mushpot cave, the one with lights. It’s right by the visitor’s center and is a good starting point. I was really glad I had my travel tripod with me. I was gonna need it! Basically all the easily accessible caves are on a loop and so you drive and park to each of them. Another good thing is my ultra-prepared husband and the fact that he had a couple of good flashlights with him. 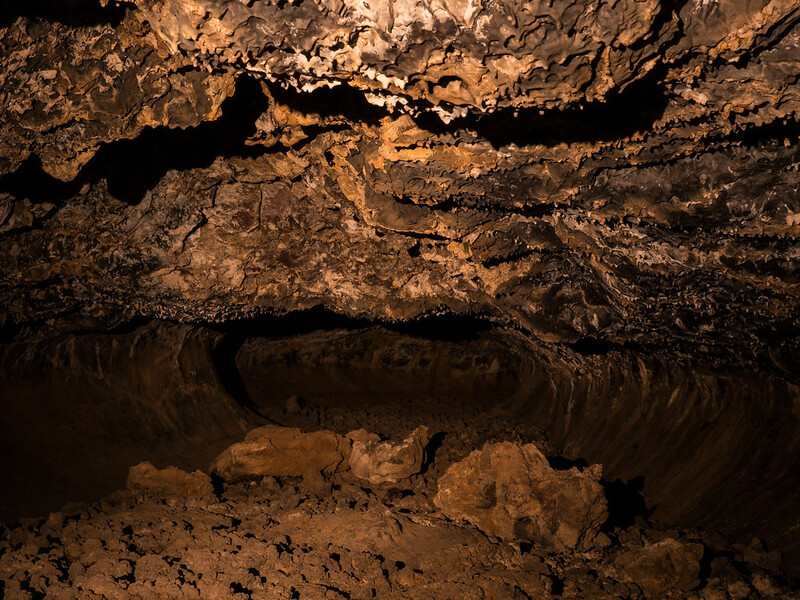 This next cave had a couple of natural skylights that allowed for some illumination, but the rest of it is in total darkness so photography would have been impossible without the flashlights. 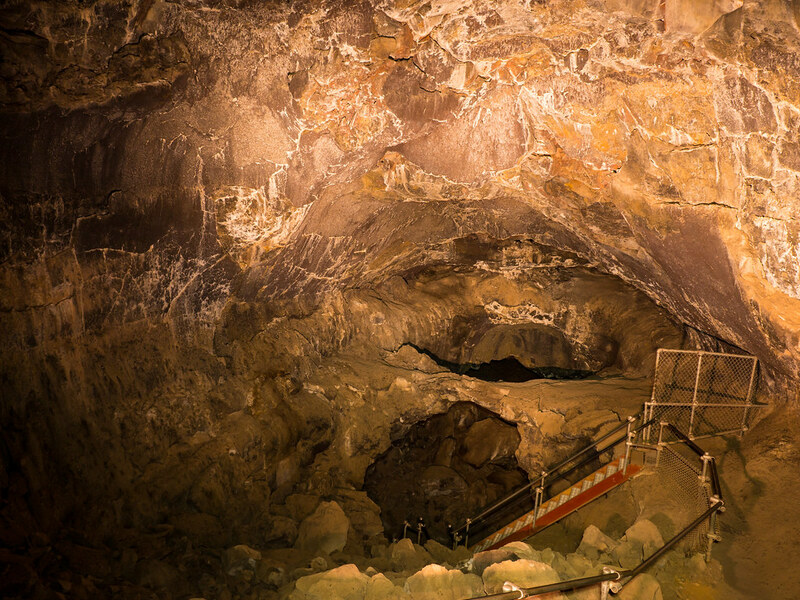 The caves are made by tubes of lava as they exploded from the nearby volcano which is called the Medicine Lake Volcano. It is still active and last erupted approximately 950 years ago. As the lava flows across the desert floor, it cools and becomes hollow inside as the flow ends and the outside layers cool. The tubes eventually are covered entirely in lava and presto! Caves. Awesome, windy, bumpy, mysterious caves. This one is called Golden Dome and the second shot will show you why more than this one. It is incredibly hard to show depth in these shots. The tunnels wind around and out of sight and vary a lot in height. We decided we were good with crouching and duck-walking, but without kneepads it’s a bad idea to crawl so we didn’t. This one is only about 5 feet high and the floor is really difficult to manage because it’s so uneven and strewn with loose rocks and rubble. At a few points between these two shots, we’d stop and turn out all the lights and just sit. Unless you’ve experienced being underground like this I can’t even describe it to you. There isn’t silence like this anywhere on earth. No sounds at all. At all. No wind. No birds. No planes overhead. No cars in the distance. Just your own breathing and the pulse in your neck. And dark. There is no dark like under the earth dark. Pitch dark. Absolute dark. Words cannot describe it. You lose all sense of surroundings and have to rely on gravity alone to guide you. Not that I moved around much, it was too treacherous, but damn it was an amazing thing to sit in perfect dark and silence. That’s the reason for the name. The rock becomes a rich, deep yellow color with splashes of green and even blue. Another big challenge for me was composition and focus. We had to keep shining the flashlights at the walls while I set up and framed. I locked the focus on the mid-distance and then we went dark for a couple of seconds and when the shutter opened we painted the walls, floor and ceiling with the flashlight beams. He would take a certain section of the cave and I another. After a few tries, I got the exposure down and just used manual settings for every shot. Color temperature varied hugely between the two flashlights and it was really hard to capture the true color of the rock. I did my best. Not all the shots translate though. It’s hard to have depth in these and so I have dozens of them that I can appreciate because I was there, but that if I was a stranger looking at them I’d wonder what the heck I was seeing. During the time we explored Golden Dome we got a tiny bit turned around and had a moment of slight panic. A lot of the tunnel looks the same and there were loops and switchbacks and dead ends. And did I mention there are no lights, maps or blazes? Yeah. Once you’re down there, you’re down there. I can’t even imagine losing or breaking the flashlights. Or having dead batteries. The panic would be intense. Only later did we learn the way to tell if you’re heading in or out of a lava tube cave. It’s all about the smiley faces. This next one is called Skull cave because of ancient bear skulls that were found at the bottom of it. Also at the bottom (there were I think four total staircases like these) is ice. Ice! It’s so deep that it never melts although now it is barricaded off because the constant traffic and soil tracked in by boots was causing it to melt. 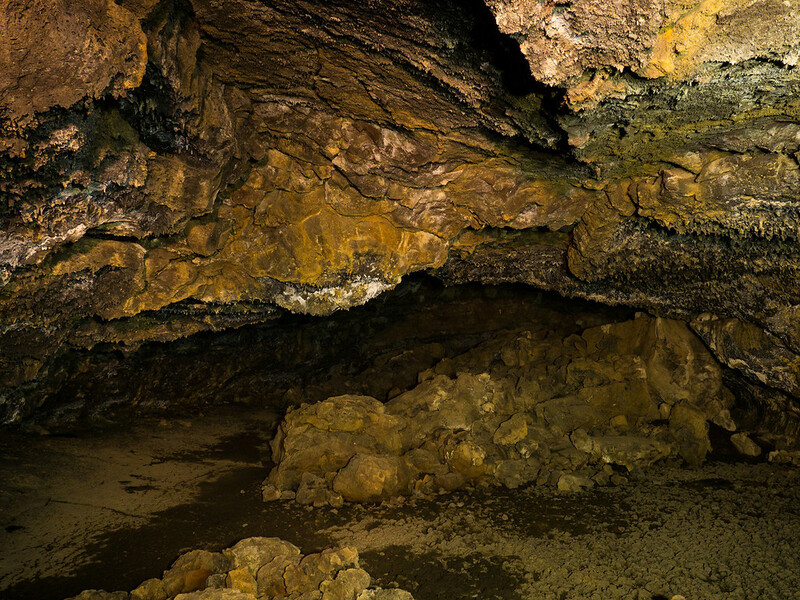 Other caves had already lost their ice, so this is the very last cave at Lava Beds that has intact ice. Very cool. Literally. It was extremely hard to light and you can see the temperature difference between the two lights really easily in this shot. 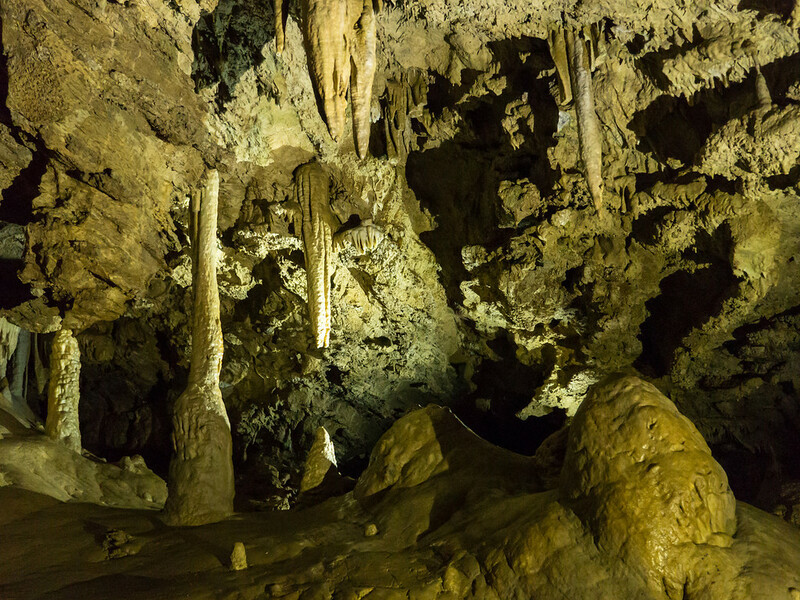 The ceiling is 80 feet high, making it the largest cave in the system. At least so far. 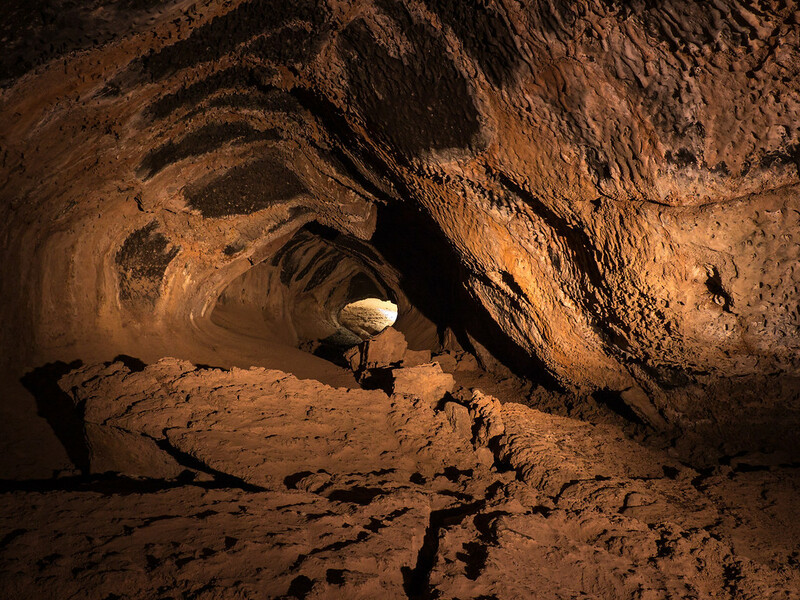 Every year spelunkers find more caves. Despite it being in the middle of nowhere California, I’d go back. And bring kneepads. Apparently way back before it was a state park, it was privately owned and they used to have weddings on this spot. Kind of cool, but damn way to inconvenience your guests. Unfortunately you could neither explore on your own nor bring a tripod into these caves and so I had to crank the ISO and shoot basically wide open. Luckily my new lenses have a maximum aperture of 2.8 so it was manageable. Handheld underground, baby. Far out. For this next shot, I put the camera on a rock wall and shot. This space used to be a speak easy during prohibition. Hundreds of bathtub gin drinkers would gather down there and line the staircases. Amazing. Don’t they look like the formations on the mother ship in Aliens? OMG. They were jaw-dropping in their weirdness and intricacy. I’m guilty of holding up the tour group because I kept turning around and around in the space getting dizzy with the idea of the time involved in making these formations. So much time that you can’t fit it into human scale. A problem I would continue to have on this vacation only above ground. So that’s our cave experience. We had no idea we’d spend so much time underground on this vacation, but we’d do it all over again. It’s so outside of the way we live our lives these days. And there isn’t much in the way of caving here in New England, so it’s especially weird for me. I loved it. There’s an update. I hope not to be such a lazy jerk in future. Sorry for the lapse. Fascinating. I’ve never been to these caves. I especially like the last photo. I could have spent half an hour just photographing those wonderful shapes. I have not seen these before, but I have been to and in the ones formed by the Mt. Helens eruption. I do agree, it is awesome in them. Thank you for all the effort it took to do these. I have missed your blogs, welcome back.